Now in a sturdy board book format, perfect for little hands! When the sun comes up and the day begins, the little bunny says good day to all the familiar things outside—o the birds in the skies and the bees in their hives, to everything one by one. And as the sun starts to set, it’s time for the little bunny to say goodnight. Goodnight, kitty. Goodnight, bear. Goodnight, people everywhere. 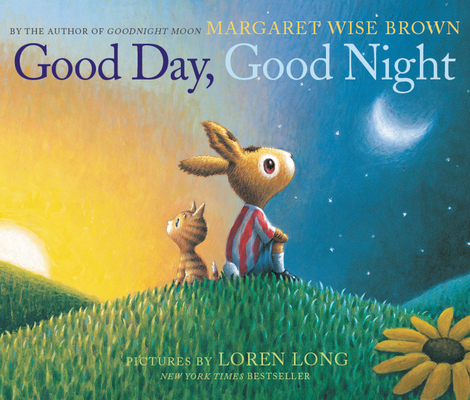 This previously unpublished text by beloved children’s book author Margaret Wise Brown features her signature word pattern from the classic Goodnight Moon that has soothed generations of children to sleep. Paired with Loren Long’s gorgeous illustrations, readers will take comfort in the reassuring world of the little bunny and delight at the attention to detail and hidden surprises on every page. Makes an excellent baby shower gift! Loren Long is the illustrator of the New York Times bestselling picture book Love by Matt de la Pena, as well as the author-illustrator of Otis, Otis and the Tornado, Otis and the Puppy, An Otis Christmas, and Otis and the Scarecrow. He is the #1 New York Times bestselling illustrator of President Barack Obama’s picture book Of Thee I Sing and the reillustrated edition of The Little Engine That Could by Watty Piper. He lives in Ohio. To learn more, please visit www.lorenlong.com.